Fieseler Fi-103 in flight. 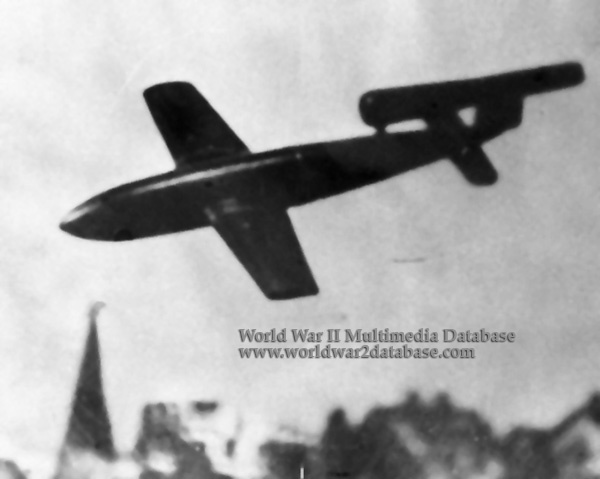 This was a flying bomb, the Vergeltungswaffe 1, V1 or "Doodlebug". About 5-7000 were launched from France towards London between June 12 and September 1, 1944. They carried nearly a ton of explosive. Many fell short in the coastal counties either because of mechanical failure or defensive measures. The line was within the flight path of these devices; an area known as "Doodlebug Alley," and Tenterden had more incidents (238) than any other district in the country. On August 2, 1944, one of these missiles fell and exploded almost opposite Bodiam Station of the Kent & East Sussex Railway. This resulted in considerable damage to the Station building by way of partially lifting the roof, and blowing in all doors and windows. Lumps of soil from the crater weighing as much as 50 pounds (22.6 kilograms) were cast on to the platform and even over the roof of the Station building into the Goods Yard. Fortunately no one was in the building at the time. Several men were working in the Station Yard and seeing the bomb falling, took refuge under trucks in the Yard and thus avoided injury. The same day, 394 Royal Air Force aircraft - 234 Lancasters, 99 Halifaxes, 40 Mosquitos, 20 Stirlings, 1 Lightning - attacked 1 flying bomb launch site and 3 supply sites in the Pas de Calais, France. Visibility was clear at all targets and good bombing results were claimed. 2 Lancasters of RAF No 5 Group lost from the raid on the Bois de Cassan supply site.